Look Of A Judge, Lash, a 2016 gelding by Judge Cash. Lash is out of one of the top barrel horse sires, the late, Judge Cash. His Dam, First Look Here, is a winner on the track. She has a SI 91 and she has won at three different distances. Her bloodlines include JD Look (2018 BIF Stallion of the Year, Strawfly Special, Special Effort, MURRTHEBLURR and Jet of Honor. 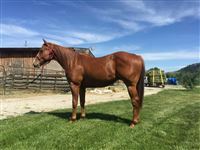 This gelding’s half-brothers, we’ve raised, are running 1D times and winning money at barrel races, futurities and rodoes. He’s a full brother to our mare, Blurr The Judge. 2017 was her futurity year. She won close to $4000 in a short futurity season. She ran 1D times against some of the top futurity riders. She's a very talented mare and had a great rookie year last year, winning money or just out of it at the few rodeos she was entered with her new owner Cranna Roberts. Lash is half-brother to Kathy Grimes hot barrel horse, Issy; the horse, Jethro, Brenda Mays qualified for the NFR on several times and the dam of Lisa Lockart's , Louie. “Lash” is powerful, fast and very agile. He's built for endurance. Great barrel prospect. Lash has 90 days training. ELIGIBLE for Future Fortune (Paid in full), BRN4D, PESI (Paid in), JJ Classics,Triple Crown 100, VGBRA 509-529-1039. Videos available. Price will be adjusted with more training.